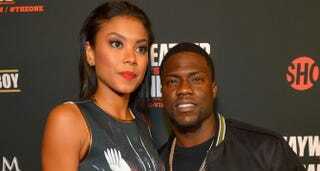 Torrei Hart and her then-husband, Kevin Hart, arrive at the MGM Grand Garden Arena Sept. 14, 2013, in Las Vegas. Your ex will get over it quickly. He has a new woman and she’s not leaving him. The women D-Wade, Swizz Beatz and Kevin Hart moved on to are still around and ain’t going anywhere. Now, maybe that’s because of their celebrity. But it’s also because those women listened to their man’s version of events regarding his ex. Also, few people think that someone who did his former girlfriend dirty will do them the same way. Add to that, all the information you have is about the past, not the present. Even if what you say is true, it’s months-old info. Move on. You’re giving your ex too much power over your life. It seems that the relationship meant more to you than it did to him, or perhaps he just healed from the breakup faster than you did. Or maybe your assumptions are right: He was cheating and had emotionally (and likely physically) exited the relationship before the two of you were officially done. Whatever happened, the bottom line remains the same: He moved on and, despite the months that have passed, you have not. You need to.